One of the highlights of taking a carry on luggage backpack (also known as a cabin sized backpack) is that you can exit out of the airport and on to your destination without having to hang around at the collection conveyor belt. Hello holiday, goodbye work! Carry-on luggage not only saves time but also limits what you pack down to the travel essentials – minimalism is the new cool. 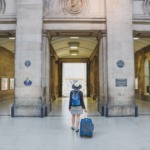 This guide to the best backpack for air travel outlines which luggage meets standard cabin dimensions, investigates which bags offer the best value for money, and, with airline restrictions getting tighter, outlines the pros and cons of convertible carry-ons. Are Carry On Backpacks For You? 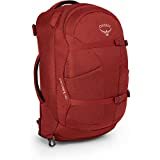 Osprey Packs Sojourn Wheeled Luggage, Hoodoo Red, 45 L/22"
22" x 13.5" x 9"
This really depends on what type of traveller you are and also what kind of trip you are taking. Carry on backpacks save you time when catching a flight. You can waltz through the bag drop (check in online to avoid the check-in desk queue too), on to security (have your 100ml liquids bag and laptop out for speedy transfer), then ready to chill at the departure lounge before boarding the plane. Since you can store your cabin bag in the overhead bins or under your seat you can keep your belongings with you, this is one reason why I love cabin only luggage. I like to have all of my electronics by side, so I am ready to work once the plane lifts off. You can walk straight out of the airport and on to your adventure. No hanging about the conveyor belt wondering if your luggage is going to show. Airlines can’t damage your kit. I’m still waiting on Turkish Airlines to refund me for damaging my luggage. It’s been three months now. Committing to a carry-on luggage backpack reduces the amount of gear you pack. We are all guilty of over packing, smaller backpacks prevent this! Airlines are really cracking down on their rules and cabin bag dimensions. 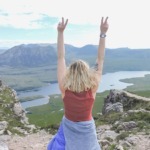 For example, EasyJet (a budget European airline) no longer allows you to carry a handbag and a cabin bag if you have purchased their budget ticket. You are allowed one bag only and it must meet the dimensions of 22″ x 17″ x 8″/56 x 45 x 25 cm. Cabin bags can get checked in too. During my big North America trip, every internal airline asked over the tannoy if travellers would mind putting their cabin bag into the hold. In the UK, EasyJet just sticks a ‘hold’ ticket on your bag leaving you with no choice but to check it in. I do have a secret trick though, check out our section on wheeled carry-on bags to find out more! There are tight regulations around the amount of liquid you can take in your hand luggage (100ml). Bottles cannot be more than 100mls and must fit into one clear bag. I noticed that Belfast International Airport has started charging customers for said bag. So now we’ve covered the pros and cons of carry-on luggage, let’s look at the best backpacks for air travel. There are three styles of backpacks. There’s the older top loading rucksack where all your luggage is packed on top of each other, like a traditional bag, and then pulled shut with a tie at the top. Personally, I think these bags are a PITA because it is difficult to get to the items at the bottom of the bag. However, they are the most durable because there is no risk of zips breaking like with the next two styles. Front loading backpacks open up like a suitcase and are often referred to as ‘booking opening’ cases or my favourite ‘clamshell opening’ bags. Obviously, it is much easier to pack a front loader as the bag zips open around the bag so you can see your items. However, two things can go wrong here – the zip tracks can break, and the pesky finger pulls can get damaged (you can tell this happened to me right?). The newest type of backpack is the convertible or hybrid bag which often comes as a 3-in-1 suitcase, backpack and daypack. This means you can use the telescopic handles to wheel the bag through cities and save your back the pain and release the back straps to wear as a backpack when the terrain turns awkward or there are crowds. Detachable daypacks are a win in my eyes because they are great for hiking trips where you leave your bigger bag in your accommodation and also for general daily travel use. However, the downside is that the wheel frame adds weight to the bag. I said I had a wee cheeky secret to avoid losing your cabin bag to the checked in pile…. A great workaround is these hybrid carry-ons because you can whack on the straps and wear as a backpack while the airport staff are planting stickers on the rest of the suitcase suckers. For this carry-on bag guide, we will not be reviewing at bags bigger than 22” x 18″ x 10″/56 x 45 x 25 cm which is the standard size of dimensions stated by the Internation Air Transport Association. Please check the size of bags against airlines you will be travelling with, we cannot guarantee they adhere to the IATA guidelines. Naturally, the less faff on the bag, the bigger the capacity. If you want maximum room for the likes of multi-seasonal travel, drop the rolling bags and go for wheel-free luggage. We will be looking at backpacks from 40L. Breathable material over the back frame is a must to avoid being like Justin Timberlake and bringing sweaty back. Airy straps are also a bonus. Ergonomically speaking, a chest and hip strap are ideal if you are going to be packing heavy and wearing the bag for any length of time. Grab handles make lifting up/out and pulling down easier. I know colours are attractive, I am a magpie for a good-looking piece of luggage too but keep in mind that after one use, backpacks get dirty. They are pulled along airport floors, used as pillows and thrown into overhead bins on planes. Stick to darker shades to keep your investment looking new. 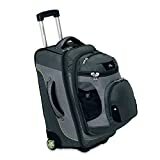 Osprey Packs Sojourn Wheeled Luggage, Flash Black, 45 L/22"
the Sojourn 45L falls in line with previous Osprey quality. The Sojourn 45L measures in at 22”x 14”x 9”/ 56 x 36 x 22cm which meets the standard IATA dimensions. It also boasts of 2746 cubic inches of storage capacity and weighs 3.60 kgs/7.93lbs. The main material is 240D Nylon with the base being made up of 1680 Ballistic Nylon. This is a hardy bag, ready for being thrown into the adventure. This soft-sided Osprey 40L is a front-loading case, opening up like a clam so you can pack easily and access your items without rummaging and annoying your travel partner/others in dorms. Inside the bag, there is one large pocket with compression straps so you can organise the bag the way you want it. There are two internal pockets running along the sides and another two on the lid. The external compression straps double up as a winged zip protector too (good as rain protectors). There are two pockets on the outside of the bag as well as daisy chain loops to attach water bottles etc to. The backpack straps are tucked away and hidden in a zipped compartment for when you want to roll. They offer a breathable, trampoline-like back support for when you wear the Sojourn like a rucksack. Surprisingly for such a small bag, there is an adjustable back to suit all heights. Think about those long train journeys with no seats or luggage storage, winning! The Sojourn also has load lifting straps to equalise the top weight, a chest strap and a very padded hip section too. The high road chassis is curved in line with your back to ensure flexibility when moving and to also stop the wheels from rubbing when you wear it as a backpack. The telescopic handle is dual tubed for a sturdier pull-along. The downside of the Sojourn 45L is that if it is packed full to the brim it can push the cabin bag dimensions to the limit so don’t go overboard with those compression straps! 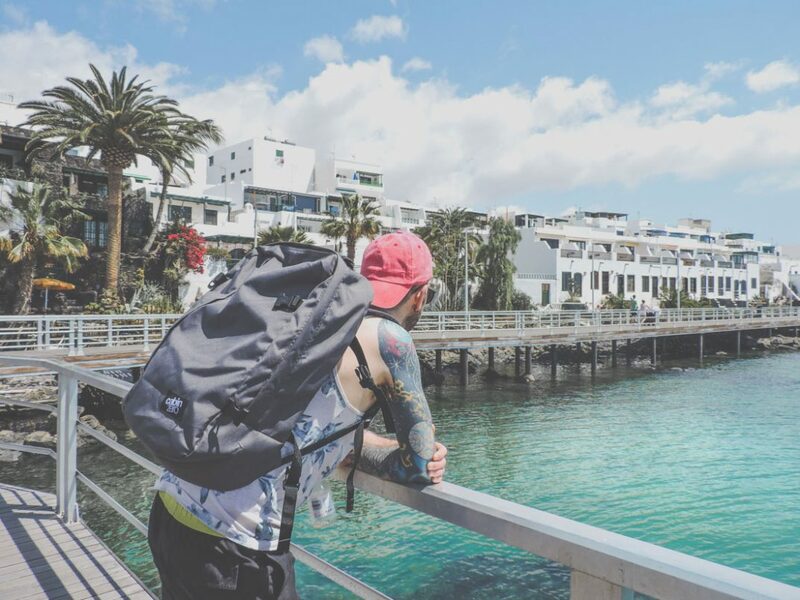 Overall, a very flexible bag for the traveller who wants to roll into a luxury hotel but also have the option to swing a backpack on for the road. You may also like our guide to travel vests. Honestly, forget fishing vests, these are stylish and safety devices which let you travel through airport security speedily. It is three bags in one! Use it as a wheeled bag, as a backpack, or as a day pack. Large main compartment with book-style opening and interior clothing straps. Removable front day pack with zippered accessory pocket, dual-side water bottle pockets, CD/MP3 player headphone port and has a back strap to allow pack to slip over the extended handle of main bag. Padded, S-shaped shoulder straps with integrated cell phone pocket on the removable day pack. High Sierra AT3 is marketed as a carry-on bag with dimensions measuring in at 22″ x 13.5″ x 9″/43.8 x 31 x 18cm which meets most airline requirements but – that does not include the detachable day bag (17” x 2” x 7”/ 43 x 30 x 8cms). It weighs 4.75kg/10.47lbs and the main material is 900 Duralight. High Sierra AT7, there are hidden straps which tuck and then zip away; not as sophisticated as one of our favourite rolling bags, the Cabin X One. The removable front day pack has space for a water bottle as well as day trip essentials. The day bag measures 19 x 12 x 5 inches/48 x 91 x 51cms. Osprey Farpoint. This carry-on rucksack is just that – no fuss, no wheels, no additional day bags, just one compact backpack with straps. The dimensions meet cabin demands – 21” x 14” x 9”/54 x 35 x 23 cms and weigh a very light 1.4kgs/3.7kg. There are two torso sizes to choose from to meet different heights and builds. like this thin one). Inside the pack there is a zipped pocket on the lid and one large pocket with compression straps (two). like these ones by Eagle Creek. Like the Sojourn, the winged compression straps keep the weight of the luggage contained and the zip tracks dry. There are two large pockets on the front of the Farpoint which fit water bottles, maps, snacks etc. The small top pocket is lined with a soft material to prevent shades and phone screens from getting scratched. There’s a front large pocket for quick grabs like the clear 100ml toiletries bags at the airport. In this section, there is a lined sleeve for laptops under 15.4” and the second slot of tablets. Most day bags only cater for laptops up to 13″ so a great find. The discreet rucksack harness of padded shoulder and hip straps are hidden in a zipped compartment. This means they can be released to use as a backpack or zipped away. There is a LightWire frame embedded in the bag to help support the weight of your luggage and the back of the bag has that spring-like material for comfort and breathability. The Farpoint also has two padded grab handles, one on the top and one on the side. One nifty feature of the Fairpoint is the additional strap that allows you to wear it as a side satchel style bag, like a post worker. This is often handy if you want to keep you belonging close to you on public transport without looking like a tourist wearing your bag as a belly. First impressions of the CabinZero – wow, that’s a lot of space for my travel gear. At 0.78kgs/1.11lbs the CabinZero 44L is the lightest bag in our backpacks for air travel guide. The Classic measures in at 20” x 14” x 7.5’/51 x 36 x 19cms. The CabinZero Classic is made of polyester inner and a waterproof polyester outer. Another pro is that this cabin bag is extremely attractive and comes in a variety of colours. The CabinZero is a unique square shaped bag with a front opener. The zips are very chunky which is great because it means there is less chance of them or the track breaking. There are two grab handles, one on top and one of the side. Inside the bag is one large pocket and two zipped pockets on the lid. There is a sleeve to the back of the pack too to slide electronics in. This section is big enough for a 15” laptop. The front of the pack is closed with compression straps and there is a pocket that runs along the front for quick grab items. There are two downsides to the CabinZero. Firstly, there is no water bottle pocket, annoying if attempting to go plastic-free like me (want to know more? Click here for my story). Secondly, with lots of storage space comes a heavy bag! Especially if you pack three pairs of shoes, six outfits and toiletries for a three-day trip to Liverpool! Luckily, there wasn’t a lot of walking with our luggage. Positively, if you were ever unfortunate enough to lose your CabinZero, never fear this pack has a Global Luggage Tracker, powered by Okoban which you activate after purchase. The CabinZero Classic also comes in 22L, 28L and 36L. PacSafe Quiksilver X 25L combines Pacsafe’s security structure with a sophisticated carry-on bag model. Measuring 18″.5 x 12.6″ x 6.3″ / 47 x 32 x 16 cm and weighing 2.09 lbs / 0.95 kg, the Quiksilver x Pacsafe meets airline requirements. The bag is made from a variety of polyester materials. Like all the bags in this review so far, the Quiksilver X PacSafe bag opens like a book. It has one large pocket for gear as well as four pockets on the lid and in the main section. The laptop sleeve fits a 15’ MacBook laptop and tech lovers will appreciate the additional patented anti-theft options that Pacsafe offers. Instead of zip fastenings that meet to insert a padlock, the Pacsafe has its own locking device. You turn the dial and pull the zip fastening up to gain access – they call this the PopNLock device. Like most of Pacsafe’s bags, there is a slash guard embedded in the material. Unlike the CabinZero, the Quiksilver X does have a water bottle pockets. The bag has adjustable straps (24.41″ / 62 cm; (max): 38.58″ / 98 cm). It also has a padded back and external compression straps to balance the weight. Overall, Pacsafe’s ranges are a trusted source for travellers looking to secure their luggage and the Quiksilver X does just that. G4Free 40L folds down to a compact 9″ x 8″ x 4″ /24 x 20 x 9cms and can be expanded to 23″ x 13″ x 8″/ 58 x 34 x 20cmwhich is 2cms over current IATA’s dimensions. The bag is naturally the lightest at 0.99lbs /450g (although I’m not giving it the lightest title because it is foldaway) and the main material is 420D Nylon. There are a variety of colours on the market! This space saver, which switches between a foldaway and a backpack, has one compartment, two top zipped pouches (inside and out) and an easy grab front zipped Spandex pouch. The main section of the bag closes by drawstring making it out only top loading bag in this review. No zips are great as they can break. There’s a hooded top to protect the drawstring opening from the elements. The bottom of the bag is double lined, improving durability. There are also two side pockets for water bottles, perfect for hiking. The padded straps also feature a chest clip. Overall, the G4Free would make a good companion if you planned to purchase goods while abroad (remove the labels to avoid ‘anything to declare’ headaches). Also great if you are taking items over for friends and family (our Scottish Aunt always wants Bisto gravy granules taken over to Singapore where she resides!) It has a handle you can clip to other bags, so it doesn’t even have to take up space in your luggage. Alternatively, if you planned to take a suitcase or cabin that you would not use for like a day bag (trekking, trips to the beach or sunning yourself at the lake) then the G4’s foldaway technique would be ideal. Choose the right clothing. Avoid heavy denim and go for travel-friendly options like the Bluffworks range. Roll ‘em. The best space-saving packing tip is to roll your clothes. This is a little harder with internal compression straps which as best suited for folded clothes but rolling gives you are more versatile shape for squeezing into dead space corners. Heaviest items go to the bottom. Zip as you pack to create a vacuum effect in the bag which will hold your belongings tightly together. Consider packing cubes, packs or very big zip lock bags for organisation. Do not use plastic bags, not only are they bag for the environment, but they are also incredibly noisy which is no ideal for multi-bed dorm rooms. Always carry a linen tote bag and pack what you need for in-flight entertainment. That way you won’t have to go into your perfectly packed cabin bag and upset the system. Be wary that some budget flights have a one bag policy, so you may need to tuck your tote into the carry-on while boarding. I’m actually typing this medium backpack guide while flying from Edinburgh to Prague and then on to Ostrava via train. I’m looking forward to pulling my carry-on from the overhead bins and scooting out the exit. Then I can enjoy the small one-hour window I have in Czech Republic’s capital city before catching the train. Airborne travel can be stress-free with a little preparation and the right carry-on kit. Plus, your cabin bag can be more than just transit luggage if you invest in the right carry on which fits your style of travel.